If you are a night club owner, you probably already know that the things that you have to worry about are endless. Along with managing employees and keeping up with your bookkeeping, you also have to make sure that you have something great to offer with your night club and that you promote and advertise your club sufficiently so that you can bring in plenty of business — and plenty of profits. Another thing that you have to think about as a night club owner is how to keep your club as secure as possible. Keeping your club secure makes it a safer and more pleasant place for all of your patrons, and it also helps to keep you, your employees and your valuable investment safe. There are several ways that you can keep your night club safe and secure. Installing an HD security camera system is a great start, and there are other methods and equipment that you can follow and use in order to make your night club as safe and secure as possible. Why is Night Club Security So Important? In a perfect world, you wouldn’t have to worry about your business being unsafe. However, it isn’t a perfect world, and there are unfortunately a lot of things that can go wrong. Therefore, it is important for you to take the proper precautions to keep everyone and everything in and around your club as safe and secure as possible. For example, you have probably spent a lot of money on your night club. From purchasing or leasing your building to purchasing liquor, beer, food, decor and more, there is no doubt that you have sunk a lot into your investment. You obviously can’t afford to lose any of your stock or cash, but you do have to worry about people robbing your business or your employees trying to sneak something out of the doors. You also have to worry about your employees. Employee theft is surprisingly prevalent in night clubs and other types of businesses, and you also have to worry about how safe your employees are. By keeping a security camera system in place and using other methods and equipment, however, you can help prevent employee theft and can help ensure that other people don’t try to mess with your employees. Making sure that everyone is following the rules in your night club is an essential if you want to run your business without worrying about breaking the law or incurring any fines. There are a lot of strict alcohol-related laws out there that you should follow if you don’t want to have problems with your local alcohol board, and having security cameras in place can encourage employees to always follow these rules and can make it easier for you to enforce them if people haven’t been following them. Lastly, you have to think about overall safety and security when it comes to a night club type of setting. Because of the nature of the business, there really is always a chance that someone could get hurt or that someone could have ill intentions. Even good people can do things that you wouldn’t ordinarily do when they are drinking at a night club, and a lot of people with bad intentions also frequent bars hoping that they can steal or commit other crimes. Should You Invest in HD Security Camera Systems for Night Clubs in Miami, FL? If you have not already, you should certainly consider investing in HD security camera systems for night clubs in Miami, FL. Whether you run a small bar or a large one, or if you have several different night clubs, it is imperative for you to keep them safe. Although you might be afraid that you will have to spend a lot of money on an HD security camera system for your night club, you should know that the investment is well worth it. These systems can be purchased for surprisingly low prices if you do a bit of comparison shopping, and you can make your system last for a surprisingly long time if you take proper care of it, making it well worth the investment. When you are shopping for the HD security camera system for your Miami night club, make sure that you shop with a company that you can count on. A lot of people make the mistake of purchasing their security cameras and equipment from the same stores where they purchase their groceries and household items from, and this really isn’t a good idea. Although you might be able to use one of these systems for a little while, it probably won’t last as long nor will it have nearly all of the features that you need for optimal security in your night club. Therefore, you should certainly consider shopping with a company that specializes in selling security cameras and security camera-related equipment, such as digital video recorders. By shopping with one of these companies, you will be able to benefit from expert experience, and you can also choose from some of the best security camera-related equipment that is available in the industry. These companies are also typically much more helpful when it comes to helping people to find the security cameras and related equipment that they need in order to protect their night clubs and other businesses. It is also important not to spring on the first HD security camera system that you come across. Instead, you should shop around, check out all of the features and equipment and even consider reading a few online reviews so that you can ensure that you are making the best decision with your system. Purchasing an HD security camera system for your night club is relatively easy, but you do have to make sure that you are getting all of the equipment that you need. • A digital video recorder is an essential piece of equipment for night club security in Miami. There are lots of different models for you to choose from, so make sure that you choose the DVR that you need. When purchasing a digital video recorder, make sure that the one that you choose is compatible with the number of security cameras that you need. Also, look for useful features like the ability to burn DVDs of your surveillance footage and plenty of storage space for holding footage for a couple of months. A security system expert can help you immensely in this selection. 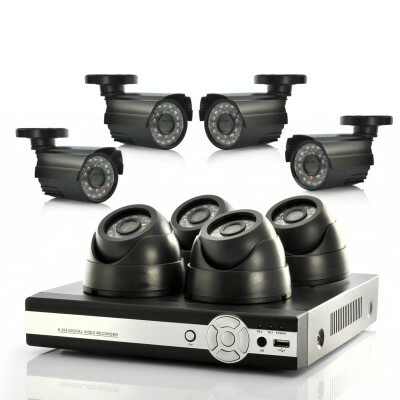 • Security cameras are also obviously an essential part of your security camera system. When you are shopping for security cameras, make sure that you take special care to choose the right ones. Being able to see your footage in HD is important so that you won’t miss a thing when you are watching your surveillance camera footage and so that everything will be nice and clear. You also have to make sure that your cameras will be able to capture good footage in dark areas of your club, and you should also be careful about keeping any outdoor cameras safe from the elements. • A monitor will be necessary in order for you to watch your surveillance footage. It is easy to hook a monitor up to your system, but make sure that you go ahead and invest in a monitor that offers a positive picture quality so that you won’t lose any of the quality when you are watching your footage. Having surveillance cameras installed in your night club is a good way to keep things safe and secure, but you will be missing out on a lot of security if you don’t place ample cameras in the club. Therefore, you should make sure that you pay close attention to this list of places where you should install surveillance cameras. • Having surveillance cameras at the entrances and exits of your Miami night club is essential. By placing plenty of high-quality security cameras in these places, you can keep a closer eye on who is coming in and out of your night club. • The bar area of your club should also be closely monitored. This is where a lot of money and a lot of expensive stock — such as liquor and beer — are kept, so these areas can be tempting for thieves. • The dance floor is a location where a lot of fun and action goes on, but it can also be the place of such behaviors as underage drinking or sexual harassment. Although some people might see the dance floor as a place to get away with such things, you don’t have to worry about it happening in your club if you keep the club under careful HD video surveillance. When installing video cameras in these areas, however, make sure that they can still capture good footage in the dark and when bright lights are flashing all over the dance floor. • The parking lot can’t be ignored when it comes to night club security, even though it isn’t inside your club. People might get in fights or commit crimes in the parking lot, and having surveillance cameras in place can help people feel more safe and secure as they are entering and exiting your establishment late at night. Security cameras that are installed outdoors must be able to “see” well at night and must be protected; this can be achieved by purchasing cameras that are designed to withstand the elements that are associated with outdoor use, or it can be achieved by covering the camera with a protective cover. These covers are typically very affordable and can be used to convert an indoor-only use camera into one that can be used both indoors and out without you having to worry about them malfunctioning due to wind, rain and other outdoor weather and elements. Having powerful HD surveillance cameras and an accompanying system in place is important, but there are other things that you need to do in order to keep your club safe. For instance, hiring “bouncers” or security guards who can monitor who comes in and out and watch out for bad behavior on your premises can be very helpful. The sheer existence of security guards can often prevent people from trying something that they shouldn’t, and security guards that are well-trained will know how to handle bad situations and to keep your nightclub safe. Installing lighting outdoors is also helpful because it can help make your parking lot seem safer, and these lights can also deter crime. You might even decide to utilize metal detectors that the people can walk through as they enter the club; with these metal detectors in place and good bouncers using them, you can catch any weapons that people have in their pockets or elsewhere on their person before they get into your club. Although it might seem a little bit stressful to think about all of these security-related measures right now, doing so can cut down on the stress that can occur later on down the road from people committing crimes on your property or otherwise doing what they shouldn’t do. Contact us today and free your free consultation!